Henri at its core is a tool that allows users to test behaviors for screenless objects real-time. We set out to answer the question of optimization issues that exist for this new field for interaction designers. Design inherently requires iteration. It’s never (or very rarely) an act that is perfected the first time and is a fundamental working process that is used on every project. Designing for objects without screens (IoT) requires the same due diligence, and can be severely slowed down by the need to code prototypes for testing. Method created Henri in order to help close the design loop, and increase the speed, creativity, and collaboration throughout the design process. 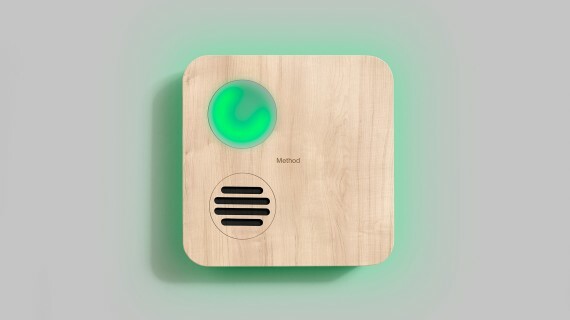 It is a sound and light emitting device whose behaviors can easily be created, recorded, and played back using a mixture of physical and digital interfaces. The physical interfaces free designers from thinking about code, therefore encouraging them to focus on the interaction capabilities of the tool. Henri was intentionally designed to encourage collaboration by allowing multiple behaviors to be controlled by a number of people at once. Method tested the tool at the IxD15 Conference in San Francisco. We worked with teams of 5-6 people, introducing Henri and giving them inanimate objects (a door, a house plant for example) to apply scenarios to. We had them as ‘what if?’ questions like ‘What if the door could tell me if an intruder is coming?’ or ‘What if my house plant could predict the weather?’. They then used Henri to apply light and sound to test the behaviors of these objects. The software saved the code, so the entire process was iterative within the group. The reaction by the teams was overwhelmingly positive and pushed the conversation of optimization tools involving IoT and prototyping to a new level.